The winner of the Palme d'Or at the 2010 Cannes Film Festival, now bound for Blu-ray in July, has just been fully detailed. 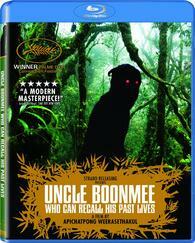 As previously reported, Strand Releasing will release the Thai fantasy 'Uncle Boonmee Who Can Recall His Past Lives' directed by Apichatpong Weerasethakul on Blu-ray on July 12. The Blu-ray will feature 1080p video, a DTS-HD Master Audio 5.1 soundtrack, and supplements include: A Letter to Uncle Boonmee, deleted scenes, an interview with the director, and other trailers from Apichatpong Weerasethakul. Suggested list price for the Blu-ray is $34.99. You can find the latest specs for 'Uncle Boonmee Who Can Recall His Past Lives' linked from our Blu-ray Release Schedule, where it's indexed under July 12.